At the International Conference on Alzheimer’s Disease (AD) in Amsterdam in 1998, Volker Herzog (University of Bonn) and Christian Haass (University of Munich) discussed for the first time the idea to initiate a nationwide priority program on AD research with a special focus on cellular mechanisms leading to Amyloid ß-peptide (Aβ) production and tau aggregation. The idea behind the initiative was to bring together molecular biologists working in AD research from complementary fields and opinions and to provide a novel platform for collaborations. In addition, interdisciplinary collaborations should be initiated by including cell biologists. Finally, an opportunity for young investigators was wanted to start their own and independent research. The DFG sponsored priority program represents an optimal opportunity to support such collaborative nationwide research on novel ideas, which allows all interested scientists throughout the country to work in the field and to benefit from a collaborative network. The program runs for six years, with international reviews at the beginning and after every other year. After a first and very successful review the program started under the name “Priority Program SPP1085 Cellular Mechanisms of Alzheimer’s Disease” in spring 1999. We covered many aspects of modern AD research centered around the cell biology of APP, the three different secretase activities and tau. In addition projects related to novel therapeutic strategies based on the cellular and molecular mechanisms discovered in our program were initiated. Drugs were screened for their potential to block tau aggregation and its detrimental effects on cellular transport, γ-secretase modulators were investigated for their potential to selectively inhibit Amyloid ß-peptide generation without affecting Notch signaling, and novel compounds were designed to block and investigate secretase activities. The outcome of these projects was summarized by the members of the SPP1085 in their articles in a special issue of “Neurodegenerative Diseases” (Neurodegen. Dis. 3 (4-5), 187-312, 2006). Moreover, we established a growing number of novel research teams led by young investigators (Drs. Weggen, Kaether, Lichtenthaler, Kins, and Steiner). Furthermore, several members of the SPP1085 obtained major positions at German Universities (Drs. Baumeister, Hartmann, Pietrzik, Schmidt, Multhaup, Walter, Müller, and Haass) and laboratories focusing on Alzheimer’s disease are now distributed throughout Germany. 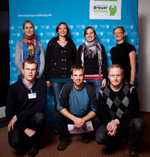 Besides funding the research projects the DFG also supported annual meetings to allow discussion and exchange of data. To these meetings all members and their co-workers, the reviewers, and selected speakers from all over the world were invited. The annual conference took place at a rather remote area in the Bavarian Alps and is now known as the Eibsee Meeting. 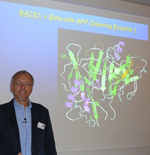 Six such meetings were held throughout the funding period including satellite meetings of the project leaders in Hamburg and Berlin where the co-speaker of the SPP has taken a chair for Biochemistry during the funding period (G. Multhaup, Free University of Berlin). These conferences turned out to be excellent places for generating new collaborations and for bringing together German AD researchers. This meeting developed to an internationally well-recognized conference. Importantly, the very special “Eibsee atmosphere” allowed detailed informal discussion during hiking and at the fireplace in the evening. Here many novel ideas and collaborations developed, frequently with inclusion and advice of our international guest speakers and reviewers. The Eibsee Meeting is now the German platform for AD research. We are extremely excited that the Hans & Ilse Breuer Foundation generously supports this meeting from 2006 on. At the Eibsee VI conference (the last meeting sponsored by the DFG), the foundation already invited Dr. Dennis Selkoe as a keynote speaker. Moreover, the Hans & Ilse Breuer Foundation will not only help to keep German AD researchers together by supporting the Eibsee conference, but will also directly support AD research in Germany by offering a major research award (100.000.- Euro) and several stipends for Ph.D. students. It is our great pleasure to congratulate Dr. Harald Steiner as the first recipient of this award. 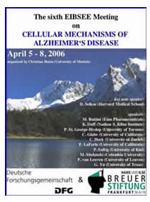 From 2005 on the Eibsee-Meeting was also the annual conference of the SFB 596 “Molecular Mechanisms of Neurodegeneration”. 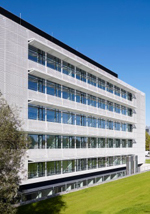 This SFB was established in 2000 as a consortium with groups from the universities of Munich (LMU and TU), the Helmholtz center and Max Planck Institutes. The idea behind the SFB was the assumption that neurodegenerative disorders share common mechanisms. The parallel and highly cooperative investigation of seemingly different disorders enabled the SFB to quickly transfer essential technological knowhow and new ideas regarding the cellular mechanisms. This involved numerous interdisciplinary co-operations which ranged from biophysics over biochemistry to cell biology, animal models and in some cases even to experiments with human specimens. Therefore, the Eibsee-Meeting was an ideal place for the researchers to discuss their results and organize new collaborations. For young scientists this was also the opportunity to present their data in the poster sessions and meet new research groups. After three funding periods the SFB had achieved a fantastic basis, which allowed the LMU/TUM and their medical faculties to establish an excellence cluster (SyNergy, the “Munich Cluster for Systems Neurology”) and led to two novel institutes, the Institute for stroke and Dementia research (ISD) and the German Center for Neurodegenerative Diseases (DZNE). Both SyNergy and the DZNE are now co-organizers of the Eibsee-Meeting. SyNergy promotes integrative research into a broad range of neurological diseases, with the aim to improve pathomechanistic understanding and eventually therapeutic options. The central focus is to foster intense collaboration amongst its investigators across the traditional boundaries of neurodegenerative, -inflammatory and –vascular diseases.